Kelly has a master’s degree in mental health counseling from OSU, Cascades. She is a Nationally Certified Counselor (NCC), through the National Board of Counselors, and is currently pursuing her licensure in professional counseling. Prior to this, she completed her bachelor’s in biology from Sonoma State University, CA. Kelly’s philosophy centers around the uniqueness of individual, the importance of connection, and the certainty that all of us at some point struggle. Her approach is client-centered and collaborative. She believes our individual personality, cultural background, biology, and beliefs lead us to move through the world in unique ways. Kelly works to help clients make changes in their life by creating a safe and welcoming space where people can explore their concerns, gain insights and develop skills. She works with adults, couples, teens, and families. Kelly has experience in many areas including: depression, anxiety, stress-reduction, communication, relationship challenges, past trauma, grief, family conflict, career difficulties and other challenging situations. She incorporates cognitive behavioral therapy (CBT), mindfulness-based techniques, dialectical behavioral therapy (DBT), as well as motivational and strengths-based problem-solving approaches. 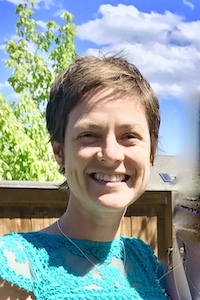 She continues to pursue specialty training in counseling techniques and interventions.